I seem to be on a roll with videos these days, but I can't help it. I keep coming across great ones that I just have to share.....like this one. Somebody has definitely built a better mousetrap here. You have got to have a look. 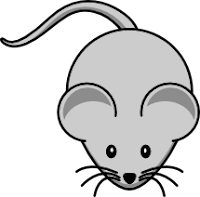 This is not some laboratory mouse either, but an ordinary mouse that somebody has trained, and it isn't really a trap. It's an amazingly creative and complicated, home made, mouse maze. What I can't figure out is how the mouse gets his food reward here. What do you think?